A home bathroom remodel can often be a great solution to restoring your bathroom to new, and can help you keep it smelling clean. If you aren’t in the market for a remodel at this time, however, here are a few alternatives to keep your bathroom smelling nice. The typical damp bathroom environment is the perfect place for the formation of odor-causing mold, mildew and bacteria. Keep your bathroom as clean as possible and follow a regular bathroom cleaning routine to eliminate odors and keep health hazards at bay. Have your preferred bathroom contractors install an exhaust fan in your bathroom, and wire it to your light switch so that it turns on when the bathroom is in use. By ventilating properly, you prevent the formation of mold and mildew that can encourage the spread of bacteria and odors. If your bathroom has a window, open it periodically to vent steam and let air circulate more freely. Make a wreath with fresh sage, rosemary, lavender or evergreen as your base, and incorporate cinnamon leaf oil and citrus for a touch of stylish holiday decor. A few candles made from coffee and vanilla beans will lend your bathroom a fantastic aroma, and the candles will add warmth to your bathroom’s vibe. Vanilla has been shown to reduce stress and anxiety and make you calmer. The scent of sliced lemons and rosemary in a small burner will lend your bathroom a fresh, clean scent. Rosemary is known to improve memory retention and fight physical exhaustion, headaches and mental fatigue. Add a pinch of vanilla extract and cloves for an additional holiday kick! Drop a mixture of allspice, cloves, orange peel, cinnamon and ginger into a diffuser to create a pleasing seasonal aroma as you soak in the tub. 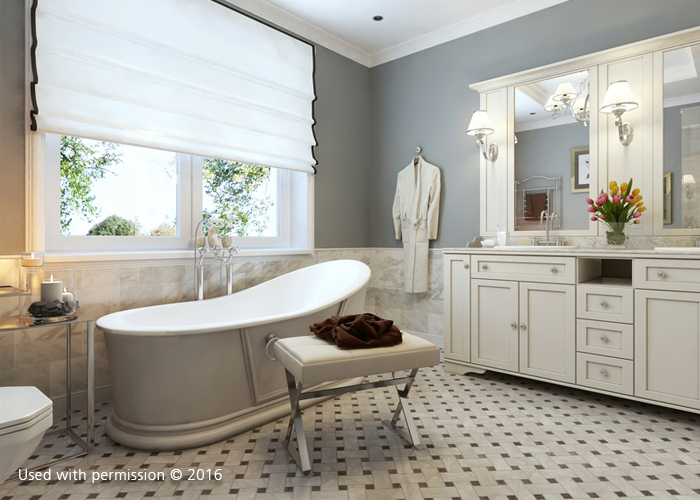 Look no further than DreamMaker Bath & Kitchen of Northeast Suburban Chicagoland for the best solutions to your remodeling needs. Call us today at (847) 327-0203 or fill out our convenient online form to start a conversation.